How traditional fitness programs have been “working the core” does not take into account the unique design and true function of the abdominal muscles. Diastasis Recti can happen to men and women regardless of age, weight, or fitness level. 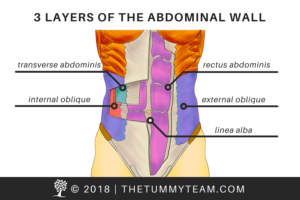 It is a midline separation of the right and left sides of the abdominal wall caused by the most common compensation pattern for functional core weakness: consistent forward and forceful pressure against the abdominal wall. Most commonly, this forceful forward pressure looks like some combination of bracing, breath holding, and bulging the belly. This forward pressure happens anytime you are in crunch-like positions, when bearing down during strenuous activity (such as lifting or exercising), and when consistently collapsing in a poor posture that causes the abdominal wall to bulge. 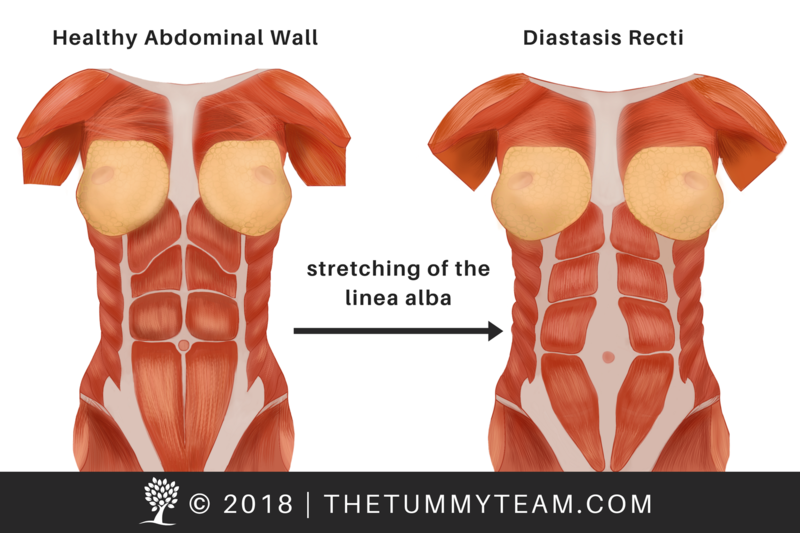 While pregnant and postpartum women are more susceptible to developing diastasis recti, poor alignment and straining during fitness also play a huge roll in the prevalence of diastasis recti in our culture. Fitness enthusiasts invented crunches in the 70s and 80s as an attempt to strengthen the abdominal muscles. The theory was that when you shorten a muscle (pulling your lower and upper portions of the abdominals together), you strengthen the muscle. Other similar exercises were also invented in an attempt to strengthen the abdominal muscles. The problem with this theory is that the abdominal muscles are unlike any other muscle in the body. Connective tissue runs down the center of the abdominal wall, and connective tissue responds quite differently than muscle. Instead of tightening when the muscle flexes, the connective tissue stretches and eventually bulges, damaging the core and leading to back pain, muscle imbalance, and internal organ issues. Every time we do a crunch, we put forward, forceful pressure on the linea alba (the connective tissue that connects the sides of our abdominals). The stress that the crunch puts on the muscle causes the top and bottom portions of the muscle to shorten, but the middle portion to separate, or bulge. 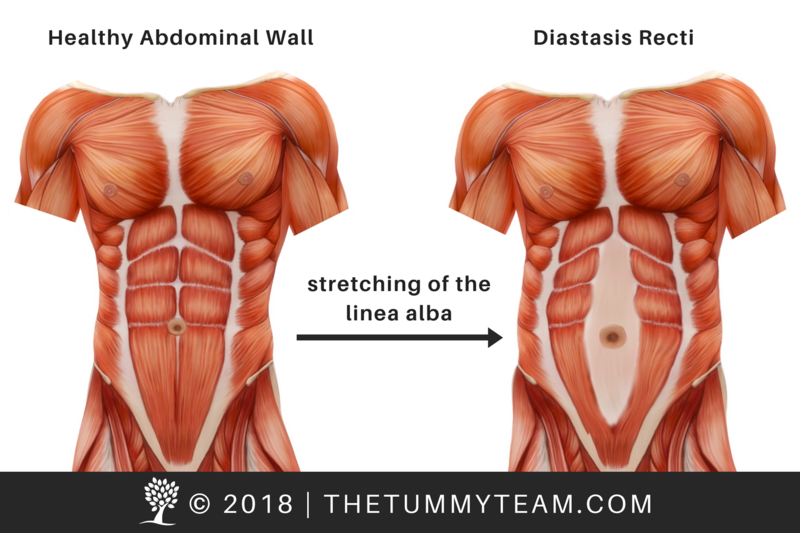 At first, it creates micro-tears in the connective tissue, but over time and with increasing intensity and strain, crunches can create the separation known as diastasis recti. Our core consists of three layers of abdominals, along with multiple layers of back muscles, pelvic floor muscles, and hip stabilizers. Our internal-most muscle is called the transverse abdominis. It is our main core muscle; it stabilizes the spine, supports the organs, assists with posture, and allows the rest of our body to function effectively. Your core is used when you lift, reach, jump, carry, bend, and do just about everything. When your transverse abdominis is the foundation of your core strength, all of the other muscles are placed in a position of balance and optimal function. Traditional core exercises (such as crunches and sit-ups) and their repetition are not part of the body’s normal function. Our bodies were designed to spend most of their time in upright positions – standing, walking, and being active – with our entire core and back engaged and stable. In order to work the recti from the middle, we need to work the transverse muscle, but not with traditional ab exercises. The Tummy Team begins with daily functional core strength activities and then we transition you into tummy-safe fitness where every exercise you do will reinforce and increase your core strength. The Tummy Team works with athletes at every level from stay-at-home moms to Olympic level athletes. We want you to be active and strong and live your best life, including the fitness and sports you love. We can give you the tools to make wise decisions in your athletic pursuit, whatever that may be. But that often begins with setting the foundation. Our rehab process does ask you to pause your fitness pursuits temporarily (we promise, it’s not that long) to help you lay this new foundation. Once you have that foundational core strength and your body is not chronically compensating for weakness, we can help you get back into fitness and sports that you love. Your goals are ultimately our goals. So if you are a new mom, we can develop simple and effective at-home fitness strategies that fit into your life. And if you are a more serious athlete, we will help you reconnect to your core, and set up optimal alignment and balanced muscle patterns to transition back into a stronger level of fitness. Whatever your athletic goals are, we can help.